Batteries UXL	There is 1 product. 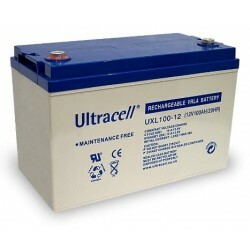 UCG Ultracell series batteries has a longer design life for buffer work. A special grid alloy high purity material ensure less gassing and less self-discharge which means less chance of battery losing capacity quickly. Thicker plates have been used on this series to extend battery life. Lower acid density keeps the battery at a lower temperature and slows down the production of corrosion. The unique design of this series means its vent can control water loss and prevent air from going inside. We recommend UXL series batteries for: Backup Power Supply, UPS, Security Systems and Fire Alarm, Banking systems, Railway and aircraft signal systems and other general-purpose devices.